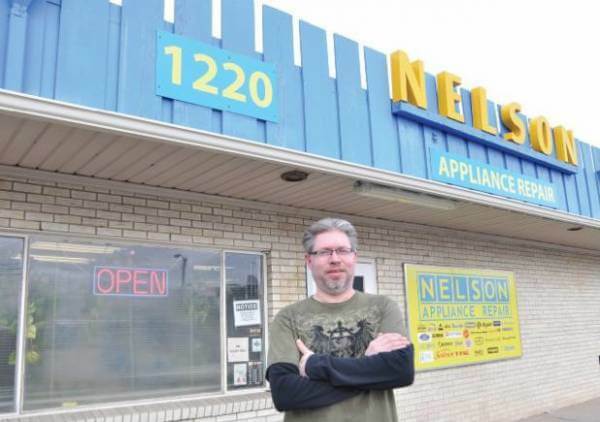 Bret Geihsler, owner of Nelson Appliance, sells new, used and refurbished items and parts in addition to servicing and repairing many appliances. Stop by for an estimate or a recommendation. Nelson Appliance is located directly behind the new Ranch Foods Direct store. Here, owner Bret Geihsler describes who they are and what they do. This business was started back in 1957. The Nelson family lived here on the property when Fillmore was still a dirt road surrounded by horse pastures. They started fixing small machines out of their garage and eventually built this shop. I came to work here back in the 1980s, and trained under the Nelsons for a long time. The business passed from them to a co-worker of mine and then she decided to move on and sold it to me. That was back in 2004. We fix and service small appliances like vacuum cleaners, shavers, lamps, mixers, a lot of espresso machines; basically anything small enough for people to carry in. If we can get the parts for it, we’ll take a stab at fixing it. We have service contracts with around 30 manufacturers. The appliances that aren’t fixable, we do our best to break down into recyclables so we’re putting as little as possible into the landfill. It’s an extra process but we feel better doing it that way. We’ve been long-time customers of Ranch Foods Direct, both my family and our employees. As a matter of fact, I don’t buy ground beef from anywhere else. We know the beef is raised and taken care of properly. I think a lot of people are looking for that now. We’ve also been in to buy raw bones for our dogs at home, and we’ve been happy with that too. So there’s all kinds of good things at Ranch Foods. When we heard Ranch Foods was coming in, we were like “wow, why didn’t we all think of this sooner?” It’s a great match. Obviously we can do our meat shopping right next door, but we recognize too Ranch Foods is going to make an awesome neighbor. I think we’ll have a lot of customers in common. When it comes to small, locally owned businesses, more people are bending that way these days. Everybody’s always looking for savings, but I think people also recognize the trade-offs, and maybe it’s not worth it sometimes. Ranch Foods meat might cost a little bit more than Walmart or King Soopers meat, but the value is what you’re looking for, not just the very cheapest thing. Same with appliances. If you want something to last, look at the quality and reputation of the company and how they handle service after the sale. KitchenAid mixers are a little more expensive than some models on the market, but they’re well-made and completely serviceable. We are still maintaining some that go back to the 1960s. As time goes on, more and more people are starting to think this way. We also recommend the Presto pressure cookers; they have a good stainless steel line. A lot of people of this generation don’t understand or know about pressure cooking, the speed it offers, the tenderness it offers for meats. Take stuffed bell peppers for example; if you put it in the oven, it can take quite awhile to get done; you put it in the pressure cooker you’re ready to serve it in 20 minutes. People sometimes are worried about the safety measures, but that’s all covered. All you need to do is buy seals for it now and then, but you’ll be able to use it for many years, even decades. A lot of people end up passing it on to their children. Other brands we recommend are Dyson and Maytag and higher end Hoover vacuums. Delonghi makes a very good Espresso machine. It’s an Italian brand, but there aren’t many U.S.-made quality espresso machines that we’ve seen, unfortunately. We’ve been here since the beginning, and we’ve seen different businesses come and go. It just works better when businesses work with each other. Fillmore is one of the busiest east-west thoroughfares, and the way the city is set up, we don’t have a lot of byways, so this is one of the main east-west arteries and has been for a long time. I see growth in the future. Sure, it will be slow, but those businesses that can hang on during the tough times will act as anchors, and help other businesses to come in. The empty real estate you see along this street, I think that’s going to start filling up in the next several years. I don’t expect it to happen overnight, because it’s going to take some time for the economy to turn around, but I think good neighbors coming in is the key, and Ranch Foods certainly qualifies. The more good businesses that pop up in the neighborhood, the more this becomes a destination for people. That’s what we’re hoping for. We’ve been here for decades. Next year will be our 60th anniversary. We have no plans to move. We’ve thought about it once or twice over the years, but once a business has been in the same place for as many years as we have, moving is really problematic. So we’ve taken that off the board. We’re here to stay, and we’re really excited to have Ranch Foods here.